Making a purchase could not be easier. Simply browse our products and click on the "Add to Cart" button. From there you can either "Continue Shopping", "Checkout" or "Update" your selection. When you check out you will be asked for a few details that we need to be able to complete the order. All prices on our site include GST and are in Australian Dollars (AUD). If you are shopping from outside Australia it is important to keep this in mind. For currency conversions you can use XE.com as a guide. This is a guide only as currency conversion will be done by your card company and may have a conversion fee. We accept Visa, MasterCard and PayPal. We do not charge for any item until it is ready to ship. Backordered items are not charged until they are shipped. If you do not wish to pay online, you may send your card information via phone or by post. In some cases for Australian residents only, we accept COD, bank transfer and cheque/money order. In these cases no items are sent until full payment has been received. 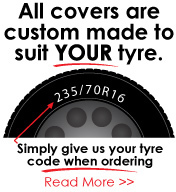 Please contact us and we will discuss what is needed to begin your custom tyre cover design. Manufacture times are completely dependant on machinery and processes involved to manufacture the wheel covers. Generally our covers are manufactured within 5-10 working days. We do not guarantee this time frame. However if, due to machinery breakdown or other factors, it does take longer we will notify you immediately. For orders in Australia GST is charged at 10%. This is included in all pricing on our site. For international customers this is removed when we confirm your order. Orders are placed over a secure SSL connection on our web site. Credit Card details are encypted. Credit card details are not kept and details are removed upon processing of the order. Our covers are designed to suit most standard tyre mounts and may in some cases not be suitable for use on certain tyre mounts. Please read our cover descriptions, view our gallery and discuss with us first any concerns before ordering. We are happy to answer questions on our covers and the design makeup of them, along with possible limitations. We try to accurately describe our covers and manufacture them according to our description, but if further details are required please contact us before ordering. Our covers are made to our specifications and we cannot customise this to suit alternate tyre mounts or situations. The covers are also manufactured according to details and tyre codes supplied by the purchaser. We are also happy to discuss with you any problems that may arise, and if possible work out an alternative solution.